Rolled oats differ from steel cut oats. Wondering, "Where can I purchase rolled oats?" If you have no idea where to start looking for the easy-to-make, easy-to-eat whole grain, you're in luck. It's simple to find rolled oats at almost every grocery store and they're very affordable. "Where can I purchase rolled oats?" is an easy question to answer. You have plenty of options, such as purchasing them from your local grocery store or from online distributors. Nearly every grocery store in the U.S. has quick oats and traditional, thicker rolled oats for sale in large cardboard cylinders. Quaker Oats is the most common and most well-known brand you'll find, but most grocery stores carry generic brands or store brands offer the same product at a lower price. If you eat oatmeal or bake with oats every so often but not all the time, buying a canister may be your best option. A large, 42-ounce canister contains about 30 half-cup servings. You can find canisters of oats in the cereal aisle, near boxes of hot and cold cereals. Instant oatmeal and quick oats are also available in the same section as rolled oats. Take a trip to your local health or natural foods store to find what might be an even greater selection of rolled oats than you'll see at the local supermarket. In addition to oat canisters, health-food stores often stock organic varieties of rolled oats, which may be sold in 1- or 2-pound packages. These oats are likely to be more expensive than traditional rolled oats due to the higher cost of producing them according to organic standards. 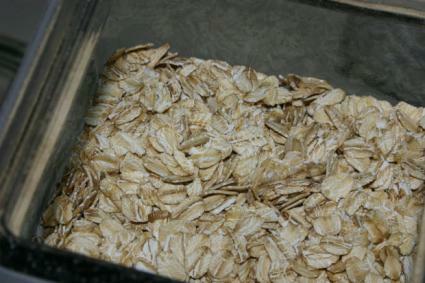 Many health-food stores also offer traditional or organic rolled oats in bulk bins for a set per-pound purchase price. Many co-ops are focused on healthy, natural ingredients and have similar inventories to those of health-food stores. One difference is that co-op members usually have access to special discounts and programs that allow them to save money on groceries, so pricey items such as organic rolled oats may be more affordable at a co-op than they would at a normal store. Grocery stores, co-ops, and health-food stores with bulk sections often sell nonperishable food items from giant bins and offer consumers plastic or paper bags to package as much or as little of these items as they want. If you need some oats but wouldn't use a full canister's worth, tracking down a bulk bin may be your best choice because you can scoop out only as many oats as you need and save money at the register. Using a bulk bin is also wise if you eat oats all the time, since the per-pound and per-serving price of bulk rolled oats is almost always cheaper than it is for rolled oats that are pre-packaged. Depending on the store you go to, you may be able to find several types of rolled oats in bulk, from quick oats to traditional rolled to extra-thick. There are a few advantages to ordering rolled oats online. They're not a fragile or perishable ingredient, so you don't have to worry about them spoiling during shipping or getting damaged in transit. There's a huge selection of many different brands and different package sizes, so you're almost guaranteed to find the type of oats you're seeking. It's easy to order very large quantities of oats online, such as 20-pound or even bigger packages. Many online retailers offer free shipping, so getting oats online isn't much more expensive than getting them at the grocery store, and it may even be cheaper in some cases. 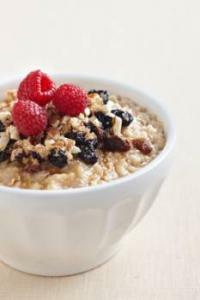 No matter which option you choose, rolled oats provide fiber and other nutrients and are a great whole grain option. Make them a part of your own healthy diet.